Social media is a label for many new Internet technologies that are used for sharing information (pictures, movies, music, and/or expertise) with other people. Examples are Linked-in, Twitter, Yammer, and blogs. Social media can gap the distance between governments and citizens. However, individuals and small groups can also use social media as a powerful mobilization tool for protesting against government policies. In 2007, Dutch students used social media to protest against the so-called 1040-hour norm. This norm refers to the total amount of teaching hours that students are required to follow each year during the first and second years of secondary education. Although required by education inspectors to comply with this norm, many schools were unable to do so, because of teacher shortages. Students complained that they were forced to be at school without taking classes and used social media to mobilize each other for mass demonstrations. At the ministry of Education, Culture and Science policy makers and the Deputy Minister in charge were completely surprised by the scale of the protests and the speed of organization of the protest actions and the mobilization force the Internet provided to the protesting students. As a result of these experiences the ministry of Education, Culture, and Science has developed an online early warning system to signalize relevant discussions about education topics on the Internet. This ‘webmonitoring’ strategy is aimed at reducing ‘strategic surprises’. This chapter analyzes the mobilization process of student protests against the 1040-hour norm in the Netherlands and the communication- and online strategy that the Ministry of Education, Culture, and Science has developed since then. Beer, D. & Burrows, R. (2007). 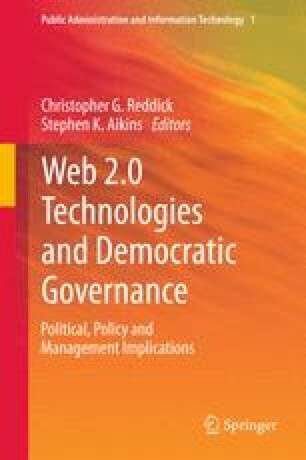 Sociology and, of and in Web 2.0: Some initial considerations. URL http://www.socresonline.org.uk/12/5/17.html.